First published in Great Britain 2010 by Jonathan Cape. London : Vintage 2011. Paperback, 216 pages. Cover illustration © Benjamin Tobitt. you have two loyal companions by your side: a bear called Dog who can sing and a dog called Bear who can dance. 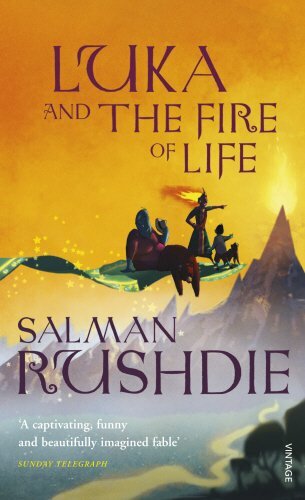 Slaman Rushdie is the author of ten previous novels, one collection of short stories, three works of non-fiction and the co-editor of The Vintage Book of Indian Writing. In 2008 Midnight's Children was judged to be the Best of the Booker, the best novel to have won the Booker Prize I its forty-year history.The Moor's Last Sigh won the Whitbread Prize in 1995 and the European Union's Aristeion Prize for Literature in 1996. He is a Commandeur des Arts et des Lettres and was knighted in 1997 for services to literature. 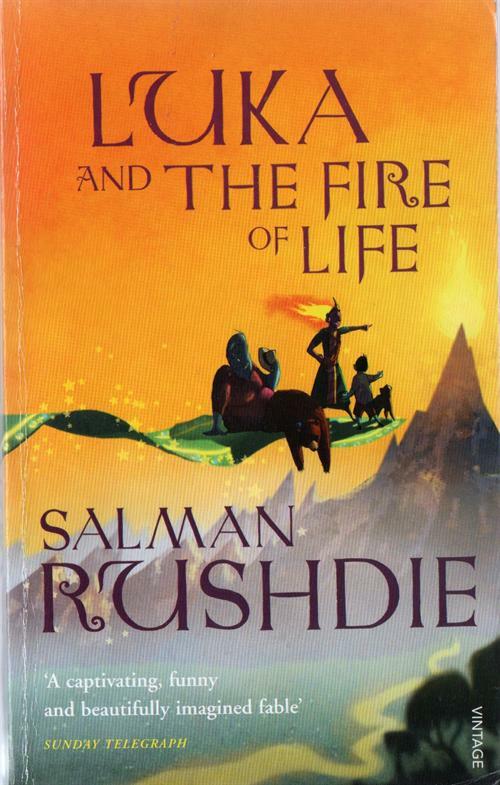 I've got two or three Salman Rushdie books in my shelf but this one was the first I actually read. I expected so much — too much probably — from him. It's quite an interesting story and the language is, well, good, but yet I fell disappointed. I expected the language to be absolutely gorgeous, to have some poetic sparkle or something. It didn't. Admittedly, I often have a problem with Indian literature. I often find it a bit too dull. So, Luka and the Fire of Life did not touch me but I think the problem lies with me, not the book. I hope the next reader (whoever they'll be) enjoys it more. This book is reserved as my January One book a month. Edited, on Jan. 31, to add that this book is now reserved for BigJohnLefty. Took quite a while before I mailed this book but I haven't been well or at home. Today I visited my books and took this one to the mailbox. Now Luka and the Fire of Life is supposed to have started its journey. Got this in the mail yesterday from Tarna as a RABCK.